The US space agency's robotic Mars explorer Opportunity has dug a trench in the Red Planet's soil to investigate beneath the Martian surface. 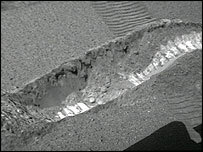 It dug the trench with its right front wheel, creating a depression about nine centimetres deep and about 20 cm wide. 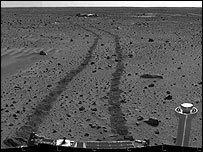 Opportunity's hazard avoidance cameras show that the soil several centimetres below the surface is much brighter than the dark-red topsoil. The Spirit rover broke a record for the distance travelled on Mars. Spirit took a picture looking back from its present position. The picture shows tracks leading away from the rover's back wheels to its landing pad, now visible only as a smudge in the distance. Opportunity dug its trench on Monday by manoeuvring left and right repeatedly, spinning its right front wheel over the same patch of soil. "We took a patient, gentle approach to digging. It's a gradual approach that digs deeper and deeper the longer we let it run," said Jeffrey Biesiadecki, Jet Propulsion Laboratory mission planner. "We start with all the wheels at the turn-in-place configuration. The right front wheel digs by itself, turning half a degree in the negative direction. This uncovers a small pile of material in front of it. "Then the rover turns to its right about 12 degrees, followed by another running of the right front wheel in the opposite direction - kicking up material behind the wheel this time." The rover then turns in place back to the left - going slightly further than before - and spins its right front wheel. When it is between these two ends, Spirit kicks up material in the direction it is travelling to prevent a mound of soil piling up in the middle of the trench. The robot was commanded to repeat this manoeuvre until Nasa scientists were satisfied with the depth of the trench. Mission scientist Rob Sullivan said the "cloddy" nature of the soil on the upper walls of the trench had caught the eye of the science team. One possible explanation could by the presence of sticky salts in the soil. Mr Sullivan said scientists were at a loss to explain the brightness of the soil at the bottom of the trench. "It could be that we've discovered something intrinsically different down on the floor of this trench than we've seen on the surface," said Mr Sullivan. He added that the rover would now take measurements of the bright soil using its spectrometers and microscopic imager on the rover's robotic arm. This data would be compared with similar measurements of soil taken before the trench was dug.